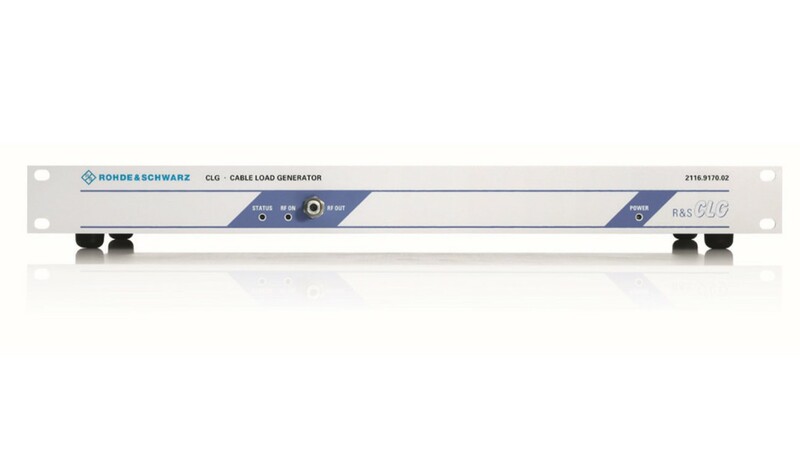 To measure linearity, a single R&S®CLG cable load generator generates the entire full digital channel load of a cable TV network. 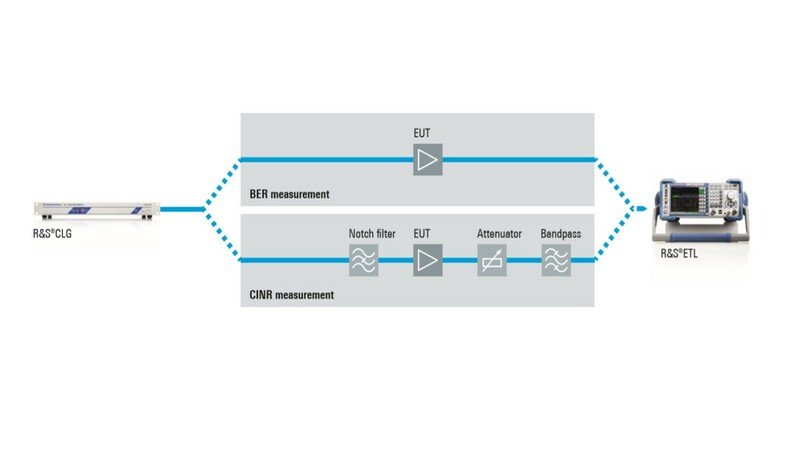 When the R&S®CLG is used together with the R&S®ETL TV analyzer, the resulting bit error ratio (BER) or carrier-tointerference noise ratio (CINR) can be directly determined in line with IEC 60728-3-1. In order to ensure a reliably high data rate for cable TV network customers, manufacturers and cable network operators must optimize the signal quality of their cable amplifiers. A key factor is the linearity of the characteristic. The higher the linearity of the amplifiers in the digital cable TV network, the less the disturbance power of intermodulation products, i.e. unwanted frequencies that occur when each individual frequency of the wanted signal is amplified. Maximum interference mounts up in the cable during a full digital channel load in a quasi-noiselike manner, since the power of the intermodulation products in this case is uniformly distributed over the entire spectrum. This most critical operating situation is also especially attractive for practical use, because the full cable capacity is utilized in this way. 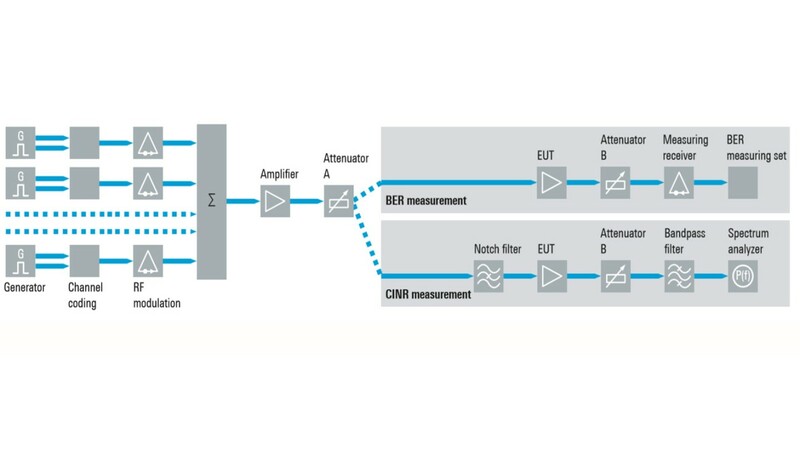 To detect impairments in the amplifier's linearity, a test signal with full digital channel load and sufficient freedom from interference is needed. 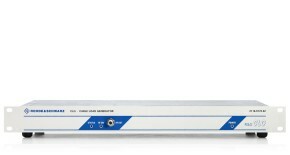 The compact 1 HU R&S®CLG generates the required test signal with the entire full digital channel load – for any digital cable standard (J.83 A/B/C). Each individual channel is continuously modulated with known PRBS content at typ. 40 dB MER in realtime, enabling direct BER measurements in the entire frequency range without having to change the configuration. Since the power can be individually set for each channel, the desired channel can be blanked out for the CINR measurement at the press of a button. The inherent CINR of the R&S®CLG is 53 dB (typ.). By using an external 30 dB notch filter, it can be increased to well over 60 dB (IEC 60728-3-1 requirement). Depending on the definition of the EUT's operating point, the configurable sum output power of the R&S®CLG of up to 120 dBμV makes it unnecessary to additionally insert the usual amplifier/attenuator combination. CINR measurement as per the test configuration shown below with the R&S®ETL. In combination with the external narrowband bandpass filter, whose influence was offset internally by a preceding frequency analysis, a CINR up to approx. 65 dB can be verified. 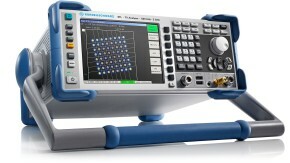 The R&S®ETL TV analyzer with built-in R&S®ETL-B203 preselector complements the test configuration. 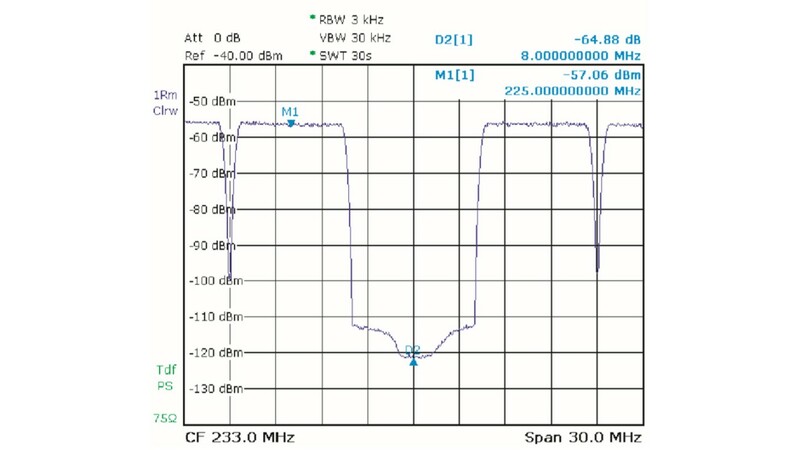 In combination with the external narrowband bandpass filter,the integrated spectrum analysis makes it possible to verify a CINR > 60 dB (see figure). The additionally available R&S®ETL-B210 realtime demodulator for J.83 A/B/C achieves a typical MER of > 40 dB and a BER of < 1 × 10–10. Consequently, even minimal BER impairments of nonlinear EUTs can be detected, for example in line with IEC 60728-3-1. Depending on the EUT output power, the integrated variable attenuator of the R&S®ETL eliminates the need to insert an external attenuator upstream when measuring BER.